High winds, thunderstorms and even hail ripping through southern Ontario have left at least two people dead, while nearly 200,000 homes went temporarily without power on Friday. 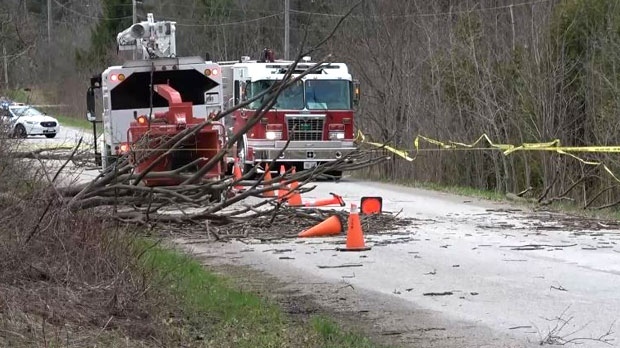 A man in Milton, Ont., died after being struck by a falling tree, while another was taken to hospital with life-threatening injuries, according to Halton Regional Police. Both men worked for a tree service company and the Ontario Ministry of Labour is investigating the incident. Police in Hamilton, Ont. say a man in his 50s also died after trying to move a downed electrical wire from a roadway. “Police want to remind citizens to treat all electrical wires as live and do not approach them,” officers wrote in a news release to CV Toronto. 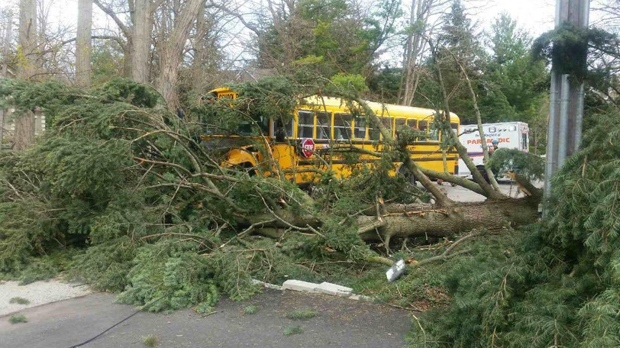 In Mississauga, another falling tree narrowly missed a school bus filled with 27 children, all between the ages of seven and 10. Environment Canada has issued wind warnings across the province, with some areas getting lashed with gusts measuring up to 110 kilometres per hour. As of Friday evening, Toronto Hydro had more than 30,000 customers without power. Hydro One said 126,000 customers in their region were powerless as of Friday afternoon. For much of the evening, Pearson International Airport grounded all flights, but the suspension has since been lifted. The airport is advising passengers to check the status of their flights as there remain several delays. Residents in the Toronto-area reported several fallen trees and even shingles being completely ripped from homes. One man was hit by a falling tree while walking on a sidewalk. "The gentleman had been struck on his head,” one witness to the incident told CP24. “He had a cut on one of his hands and was quite disoriented." In downtown Toronto, gusts ripped a storefront sign above a convenience to the ground. “(I) heard a loud bang, like a gunshot and I turn around and this thing was just completely on its own,” one witness to the fallen sign told CTV News. “We dodged it by like three seconds." In other areas of the city, winds snapped telephone poles, leaving wires dangling near roadways. Toronto Hydro is advising residents to stay at least 10 metres away from fallen wires. "The wind continues to have some strong gusts, which is hampering repairs," the utility said in a news release to CTV Toronto. "Crews can't go up in buckets to assess damage and make repairs as it's unsafe." North of Mississauga, in Georgetown, a group of half-built homes collapsed under the wind pressure. OPP closed part of a major highway between Burlington and Hamilton for part of the commute home. Weather even impacted public transit where subways were told to slow down and GO Transit trains were delayed as much as an hour. With a report from CTV News' Peter Akman and with files from CTV Toronto. We're responding to a large amount of outages in the city affecting more than 30,000 customers. We're responding as quickly as possible, but we ask for your understanding as we assess damage and make repairs. Emergency crews respond to the scene, after a tree fell on two people in Milton, Ont., on Friday, May 4, 2018.